Yesterday was Melbourne Cup day here in Australia. It’s “The Race that Stops a Nation.” Most people stop work around lunchtime to celebrate the horse race held at 3pm at Flemington Racecourse in Victoria. The festivities continue on into the evening. I found it incredible, when I first arrived in this country, to witness so much effort and activity focused on a horse-race. Since arriving in 2003, I have adjusted to its presence and love the colour, activity and effort that people make to look stylish on the day. Beautifully dressed ladies waiting for more friends to arrive! 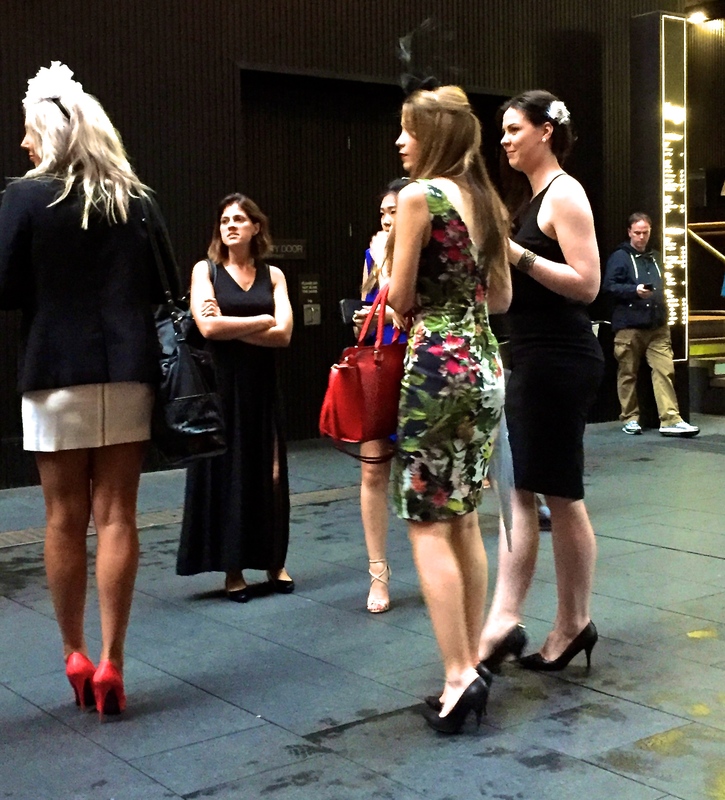 While I photographed the elegantly-clad women and men walking the streets yesterday, I was struck by the infinite physical variations among people. Yet, I also thought about how we all have the same needs. 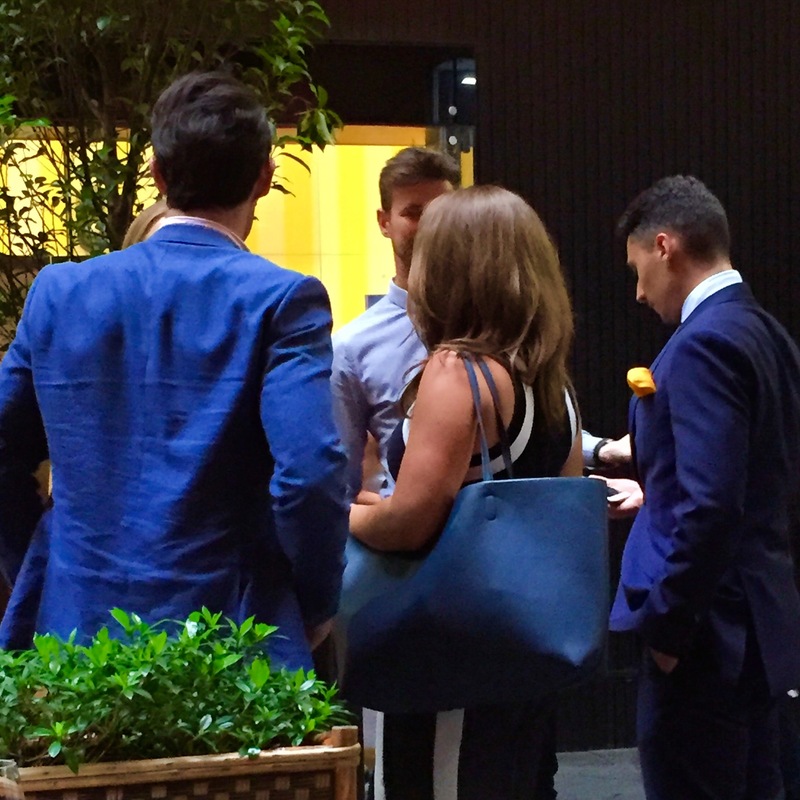 I saw young lovers, friends, best mates, work colleagues, and groups of women and men all circling around one another. What were they looking for? Belonging, acceptance, love. My day started, not with a careful perusal of my hat collection and selection of a wonderful outfit for Melbourne Cup, but with a sick child. My daughter Ofelia had picked up my son Julius’ weekend-ruining stomach bug. She was in pain. I realised that I also had a touch of the same bug and had a headache. My husband Justin was leaving early for a meeting at work. Julius was attending kindergarten orientation at my daughter’s school. And it was going to rain today. I have come to realise that the order of things is crucial. Justin prepared breakfast, as he does most mornings. I gave Ofelia a dose of Nurofen and dressed my son for “mis-matched” day at childcare. Green t-shirt and purple cords were innocuous enough. Our beloved nanny N was coming at 11:30 to look after my daughter for the day and to pick up our son from childcare later. I had a few minutes to make a drastic outfit change for the day because of the chilly and wet weather. 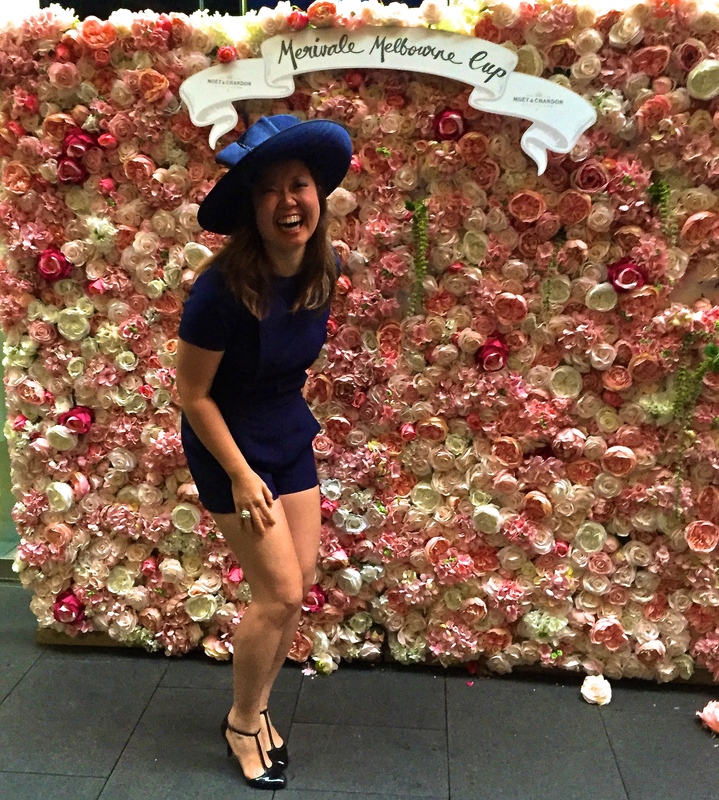 I pulled out all of my hatboxes and found a lovely hat that matched my navy blue jumpsuit. Makeup. Hair. Pannier bag for the hat which I wrapped carefully. A small handbag to carry essentials while I walked the streets “Sartorialist-style” to capture street style fashion for Melbourne Cup Day. It was heavy rainfall earlier in the day. My second raincoat had a workout! We ate eggs and soldiers for breakfast. I questioned if my daughter should have the eggs but she said she was hungry. Justin departed for the office with a kiss. I sent my daughter to brush her teeth and wash her face. She watched a little television while I took my son up to school on the Nihola for orientation. As I was walking up the stairs of our apartment building, my daughter rang to tell me that she had vomited. “No eggs for awhile,” I said and soothed her on the sofa. I made her some herbal tea. With “Frozen” playing again, I stepped out to pick up another bicycle from Omafiets Dutch Bicycles. With the extreme damage to my e-bike the other week and the steadily rising temperatures, I thought it would be a good idea to try a Gazelle ebike. Uber came and dropped me off at the shop. I rode home after a quick adjustment to the seat and some instructions from Chris. Of course, it started raining, heavily. Fortunately, my raincoat did its job and kept me dry. 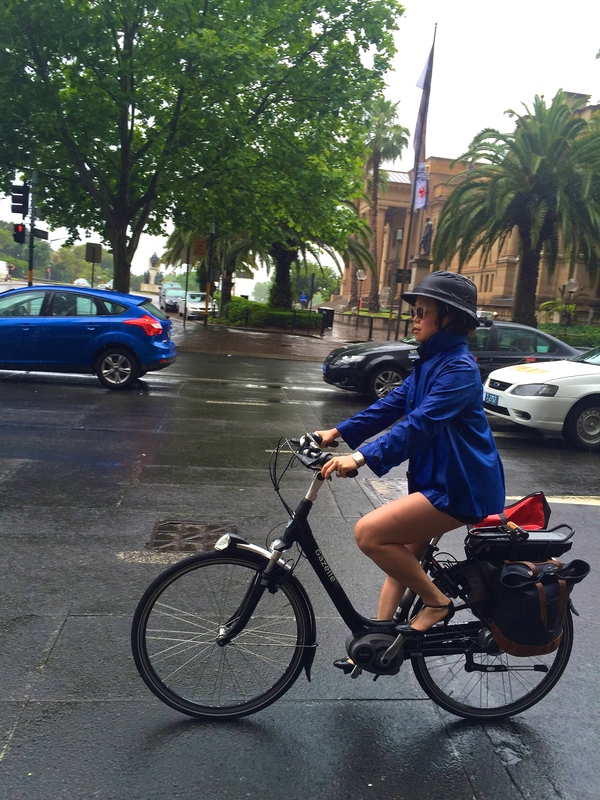 I tucked my hair into my raincover bicycle helmet. I locked up the ebike and took the Nihola to school to pick up my son. By the time, I returned home, the raincoat was completely soaked. Fortunately, I was dry, the Nihola’s rain cover had kept Julius dry and N was home with Ofelia. I hung the dripping raincoat up in the shower. N and I discussed what to feed Ofelia today. I went upstairs and the bed looked so inviting. I had some Panadol and then fell asleep, but not before setting the alarm for a ten minute nap. It stretched to 25 minutes. And then I woke up feeling a bit better. I put on another raincoat. I think the Irish call it “soft weather” when it spits rain. Soft is one thing. A downpour is another. I found a sheltered spot for the Gazelle. I went to the office, hung up my coat and dried off my legs, face, feet, heels in the ladies toilets. I was warm from the ride but I had something hot for lunch and did some work. Because of the shorts on my jumpsuit, I was barely wet under the raincoat. I just had wet legs and shoes to dry off. Twenty minutes before the race, the rain stopped and I was on the move. 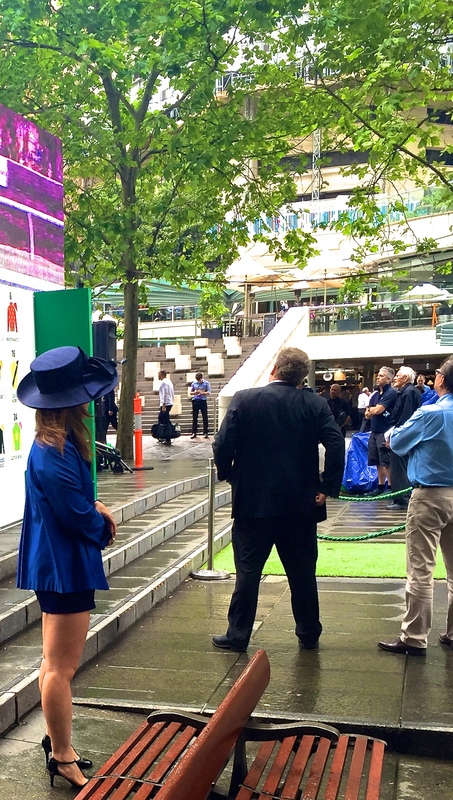 In previous years, there was brisk activity at the Martin Place “live-betting” sites, when the sun was shining. In previous years, I have placed two dollar bets for a few horses to place first, second or third after careful perusal of the odds on the internet betting sites. One year, I won seventy dollars for placing a two dollar bet. Otherwise, I don’t gamble. This year, it was relatively deserted because of the chilly rain. The crowd is minimal this year because of the rain. Everyone is watching the race while I’m look at the crowd for style. Was I going to find any elegance here? I took a few photos and this couple was beautifully matched. 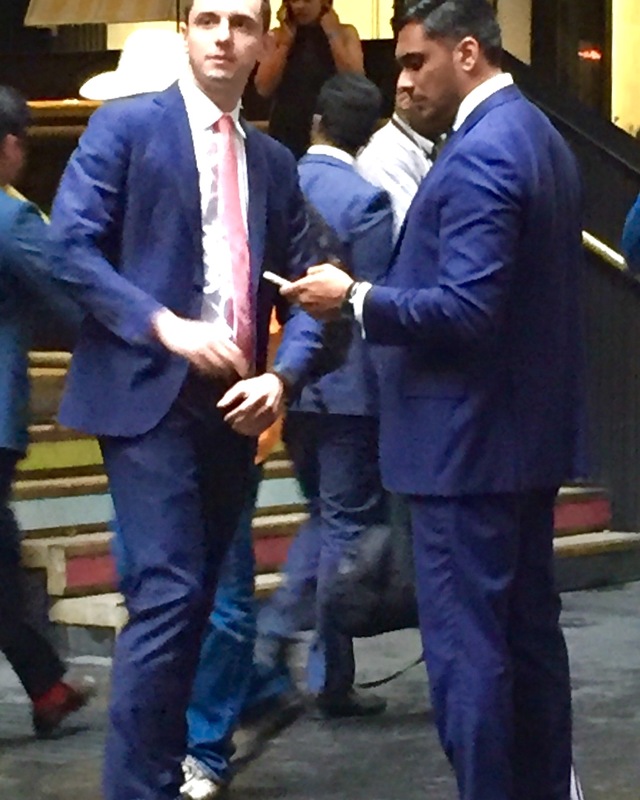 I introduced myself to a few stylish men and asked to take their photos but a few declined. I had to reformulate my photo strategy for the day. Reformulating my strategy as I depart Martin Place. I would later discover that no one wears hats anymore. It’s just fascinators now. I made my way to an elegant eatery on the ground floor of a well-known pleasure district and en route took a few post-race photos. A girlfriend joined me for a few drinks and a chat while I took photos and Instagrammed the afternoon away. 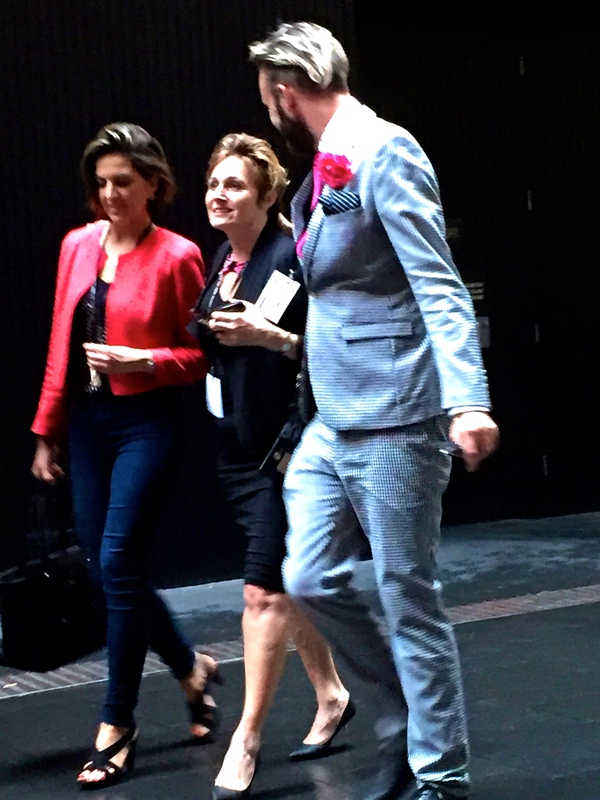 Maybe not for the corporate office but definitely fun menswear for Melbourne Cup Day! We saw a few women and men waiting for friends and lovers to join them. They were often positioned to the side of the alley under cover and on the phone. With anxious expressions on their faces, women would speak on the phone, terminate the call and then speak again. When the friend arrived, there was relief on the face, a kiss on the cheek and a hug. Then they would depart together. A moment ago, the man on the right was waiting alone. His mate showed up and it seems that they were waiting for more mates. Unless, there was a woman texting him? Men alone would position themselves in the middle of the alley, usually with phone in hand to text. The expression would be less anxious, more stoic but the relief palpable when the posse or girlfriend arrived. This lovely lady understands how less is more. Beautiful! Eventually, a man who had drunk too much for the day was escorted/pushed to the side of the walkway by security. He was ringed by three men who eventually walked and pushed him away through the crowd. I struck a model pose and couldn’t hold it because it was so funny. 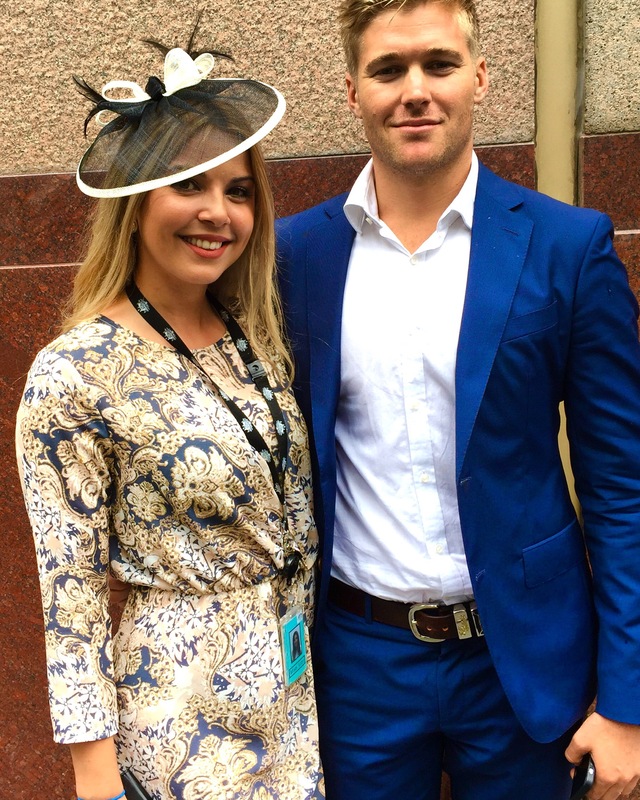 I hope you enjoyed Melbourne Cup day! Thanks for coming along with me on the day. Time to go home by bicycle. Justin made us a warm salad for dinner. We chatted about our days. A winning Melbourne Cup day for me full of love, belonging and acceptance. 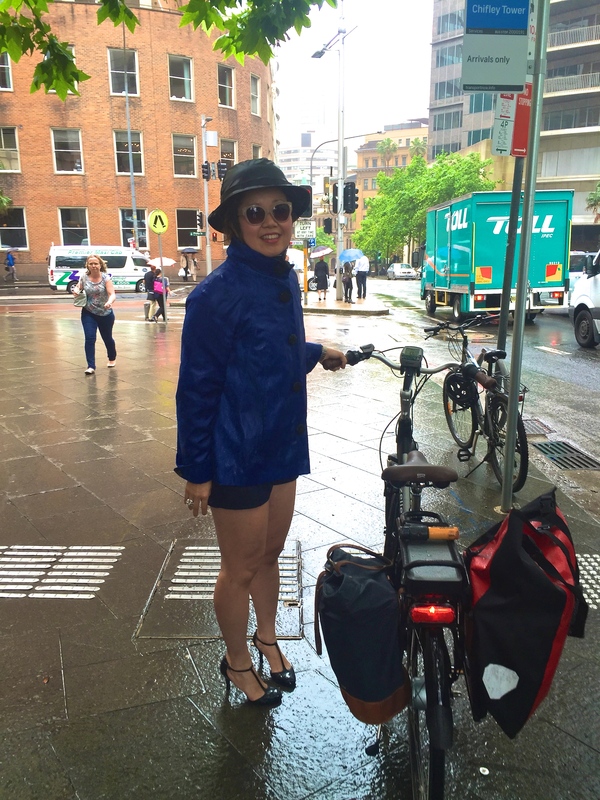 Previous postSydney Night Rides – Not Just at Night! Did I miss something? What happened to your other bike? My ebike was smashed by a car. Fortunately, I wasn’t on it.